* Mariell's Freshwater Pearl and Crystal Wedding Necklace and Earrings set adds breathtaking couture to your wedding gown. * Our adj. 15" - 17" Necklace is 1 5/8" h at the center & the matching delicate dangle earrings are 2" h.
* Add Mariell's top-selling Freshwater Pearl and Crystal Wedding Necklace and Earrings set to your store's Bridal Jewelry showcase and we guarantee you'll be adding it again and again! * This wholesale necklace and earrings set is both affordable and spectacular. * It has lovely vintage charm with sparkling crystals and beautiful freshwater pearls. 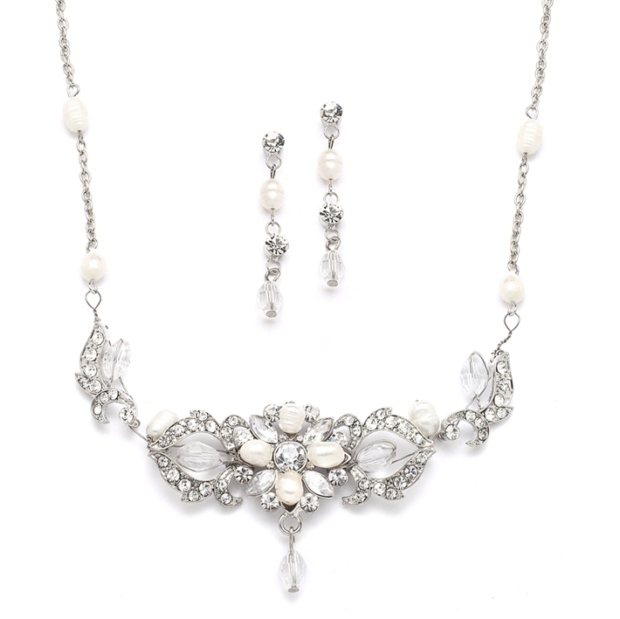 * For weddings at a Victorian Inn or on a tropical island beach, this versatile necklace set will make a bold fashion statement with a uniquely delicate touch! * Complete the ensemble with our matching bracelet (sold separately) as style 4062B.